Pink Umbrella Photography: Seven Tasty Fall Treats! This is for the older crowed and would be very yummy for a Halloween party for adults. Its white and orange, jiggly and tastes like a creamsicle. Go over to Thats So Michelle and check out her recipe. -1 bottle pinnacle whipped cream flavored vodka. This is SOOO yummy. I cant hardly wait till I make this myself and eat it. This would be such a cute gift for someone else for the holidays like a boss, teacher, or a white elephant gift. 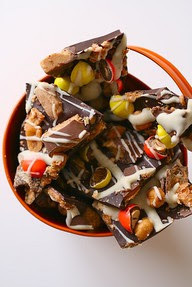 Check out Glorious Treats for the exact recipe. Who does not know how to make S'Mores? This is one of my favorite treats in the summer and now that summer has come to an end what better way to keep my favorite dessert around. 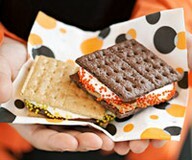 I found this from Better Homes and Garden but it is super easy and the same as making normal S'Mores. Love these, Lynn. How fun. Lots of great ideas for gift giving. I really like all the candy corn treats. 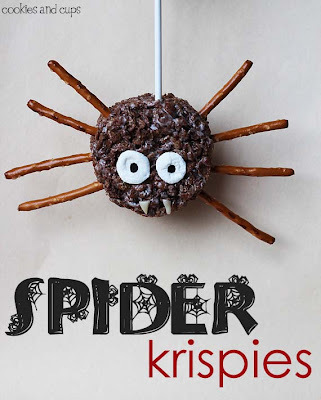 Thanks for linking up and sharing these yummy fall treats last week. Your list was one of the most clicked submissions. Hop over and check out your feature. Thanks for sharing these! I think the first one looks so delicious! I am pinning these! Wow, what yummy treats! You shared some great links and recipes-thanks so much! Glad you guys are enjoying these yummy treats. 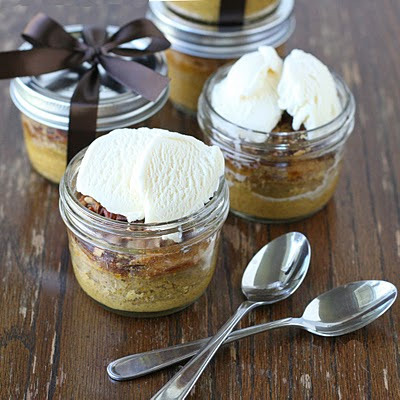 Jammie Girl did you ever make the pumpkin pecan dessert? What great deserts!! I'm going to try several of these!! Thanks!! I found you on SomedayCrafts! 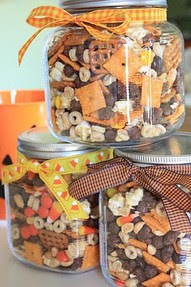 These all look so tempting to make, but I will certainly try the snack mix! That pumpkin dessert looks yummy! I wonder if you could make it with sweet potatoes instead? Stopping by from TT&J. They all look great! I am your newest follower! Please stop by my blog sometime. Thank you for all the great ideas! Thanks for sharing at Taking A Timeout Thursday! What cute & YUMMY ideas! I love it! How exciting Trish..., Thanks for stopping by. Oh my goodness! These treats are amazing! Thanks for compiling and sharing them! Oh oh oh YUM! 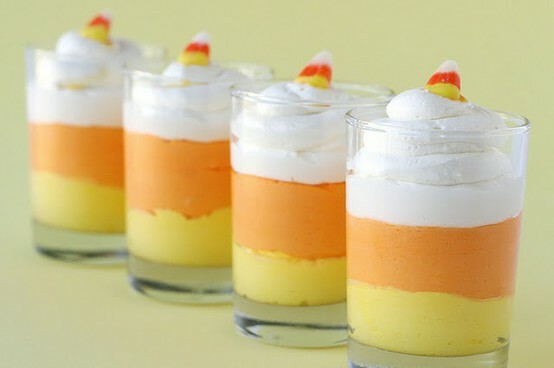 Those candycorn mousse cups look delish and the little jello shots are too cool! Thanks so much for sharing! I would be delighted to have you stop by and link this up to my VIP party this weekend! http://designergarden.blogspot.com/2011/10/vip-party-34.html Have a safe and happy halloween! After reading this, I thought...Gee! I should have a party so I'd have a good reason to a make all of these. haha! Thanks for the stroll down yum-o lane! Also BIG THANKS for linking up at the Rock N Share! I hope you'll make it a Wed. regular! This is a very nice list of goodies! شركة من اكبر الشركات الامنية في مصر علي اعلي مستوي من التميز استمتع معنا بافضل الخدمات المتقدمة من شركة الحارس الخاص في مصر شركة امنية علي اعلي جودة وتقدم في العمل علي اعلي مستوي من التميز شركة حراسات خاصة سوف تقدم اليكم كافة الخدمات المتميزه والعالمية بيد متخصصين في الحراسة .